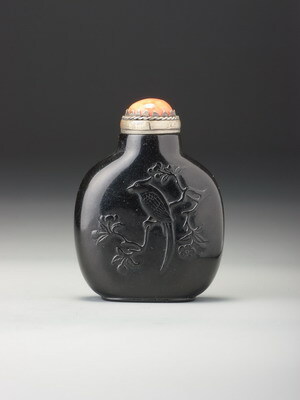 This understated but extremely elegant little bottle has a number of features that associate it with the palace workshops. It is small, well hollowed through a wide mouth, but leaving a heavy foot area (in this case, 0.73 cm deep). It has flat outer lips on the upper neck rim and the flared and deeply recessed foot that is also a tentative palace feature. The material is less flawed than with many examples attributable to the palace workshops, and the flaws are cleverly concentrated on one narrow side to minimize them. The mask handles have small, individualistic masks of considerable personality, while the rings have been replaced by a strange double floral motif. The mask handles, which are a feature of Imperial products of the eighteenth century, are distinguished by the frequent variation from the more standard patterns that appear to have governed these secondary details from other workshops. It is also notable that the few known mask-and-ring handles that have the rings replaced by other features or absent entirely tend to be attributable to the palace (see Moss, Graham, and Tsang 1993, no. 37). The form is yet another modified meiping (‘prunus-blossom vase’) typical of court production, and the sharply defined, deeply recessed, lipped foot refers, perhaps, to earlier vessels in bronze, again a key source of influence for palace artists of the Qianlong era. All of these features would dictate a reasonably confident attribution to the court workshops under the circumstances, but as a final endorsement there is inscribed one of the smallest, neatest, and most convincing palace reign marks known, which is remarkable considering the depth of the foot and the difficulty of access for the carver. For a very similar mark with only one variation in the formalization, see Moss, Graham, and Tsang 1993, no. 32.